Join KreweDCM this Halloween for a macabre maritime voyage beyond the seven seas and into a heretofore unknown 8th haunted ocean, the Dead Green Sea. Produced in partnership with Honk! TX, this year’s parade is an exploration of a watery existence, warped by the crushing depths of the Dead Green Sea. All ye sea witches, drowned sailors, and lovers of leviathans–come witness the maiden voyage of KreweDCM’s undead whaling ship, the HMS Phorcys. 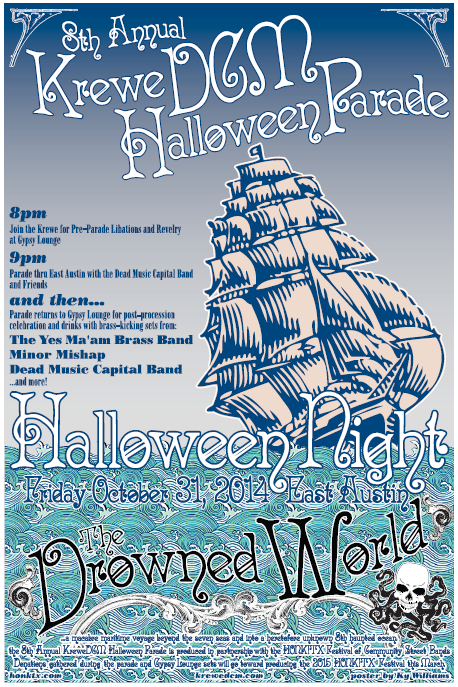 The DMCB Halloween Mega-Band will lead the procession through East Austin. After the parade, the Krewe will return to the Gypsy Lounge for a post-parade show to benefit HONK! 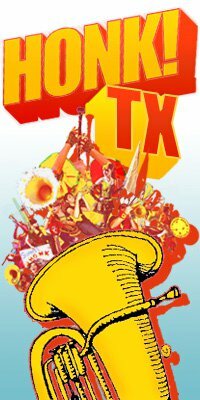 TX featuring brass-kicking sets from Dead Music Capital Band, Yes Ma’am Brass Band, Minor Mishap Marching Band, and more. …and then – Parade returns to Gypsy Lounge for post-procession celebration, drinks and dancing at the Honk! TX (official page) Halloween Funraiser! Thank you LUCKY 2013 Sponsors! Austin’s only East Side Honky Tonk featuring live music seven days a week. As a friend of KreweDCM and the HONK!TX, these great guys and gals welcomed us into their fine watering hole so we’d have a great place to launch our lucky streak thru the night. Located in the heart of East Austin. Queer- ever shifting, ambigious, multi-valent and indeterminate bar/venue. 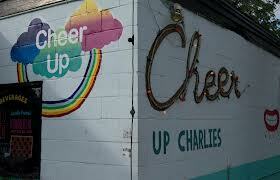 What Happens at Cheer Up STAYS at Cheer Up. Believers in the mission of HONK!TX, these fine folks are always the hugely gracious hostesses with the most-esses! KreweDCM and the Dead Music Capital Band have shared some of our favorite Halloween moments with the staff and patrons of Cheer Up Charlies! Austin’s biggest, boldest, and brassiest nonprofit, community-driven festival. HONK!TX brings brass bands from around the country to perform absolutely free in the public spaces of Austin, TX. Look for HONK!TX 2014 this spring–March 21st-23rd! We are proud to have such great support and friends help make LUCKY 2013 possible! Come get your wristband on the patio for drink specials–see below for more info!! We are upping our ante this year by partnering with the HONK!TX Festival. Our parade is the kickoff for their 2014 fundraising–make a donation to HONK!TX and we’ll give you a wristband good for drink specials at our pubcrawl stops. Everybody wins at LUCKY 2013! A big thank you goes to our LUCKY 2013 in-kind sponsors–the Whitehorse and Cheer Up Charlies. Don’t forget to bring cash–parading with KreweDCM can be thirsty work. Your bartenders will thank you and cash speeds up your time at the bar. Less time waiting on plastic means more time for dancing! The parade is sure to be a huge amount of fun–this time next week you’ll be thanking yourself for helping share such Halloween Joy. Laissez la Fin des Temps Rouler! KreweDCM is ready for our 6th Halloween spectacle…are you? Get your costume and dancing shoes on and meet up 7:00 PM at 2nd and Caney St Wednesday 10/31/12 for the Apocalypse 2012 Halloween Secondline Parade. At 8:00 PM, the Dead Music Capital Band will start the music and we will Let the End Times Roll! The Apocalypse is upon us…go out on your feet, dancing in the street! HAPPY HALLOWEEN! BUY A SHIRT TO HELP US DEFRAY 2012 PARADE COSTS! Order Today to help KreweDCM defray the cost of our 2012 Second Line and Pub crawl! Click below to order an “Apocalypse 2012” shirt for only $10.31. Or, for the ominous donation of $20.12 order a two shirt set that includes a KreweDCM Logo shirt & an “Apocalypse 2012” shirt. ORDER NOW via PayPal–Credit & Debit Cards always accepted! Claim your shirts in person at the parade 10/31/12 or we will ship them to you via USPS. As the dust settles from Halloween 2011 and our 5th Anniversary Parade, we would like to share links to YouTube videos of our recent ‘Circus of the 7 Dawns’ spectacle. As we gather more media, we will update the list here. Please enjoy, won’t you?